GOLD Coast Convention and Exhibition Centre (GCCEC), located in heart of Broadbeach, caters to 10 to 6,000 people. One of the most flexible meetings and events venues, GCCEC is equipped with a 6,000 seat arena, four exhibition halls and 22 meeting rooms. With a personable and bespoke approach to business that challenges convention, GCCEC serves up 10,000 square metres of total ground floor exhibition space and 2,000 square metres of unconventional external space. The all-encompassing service benefits of boutique property allow for ultimate flexibility, including exclusive branding of the Centre from outside-in. Not just a venue for large-scale events, GCCEC specialises in all events from small meetings to corporate and association conferences, national and international incentives, banquets, exhibitions, and special events. No matter the size, GCCEC excels at crafting events that feel intimate in nature. GCCEC offers the utmost in service excellence across a broad spectrum of in-house expertise: creative services, audio visual, event and logistics management and more, all designed to support clients throughout their event journey. Renowned contemporary a la carte cuisine tailored to each event features fresh ingredients ethically sourced to ensure award-winning dishes. The convention centre is consistently at the forefront of innovation and guests enjoy high-end delegate facilities including innovative plug and play technology, free Wi-Fi and advanced technological infrastructure. An internationally recognised sustainable leader, GCCEC is also the first convention centre in the world to attain EarthCheck Gold Certification. 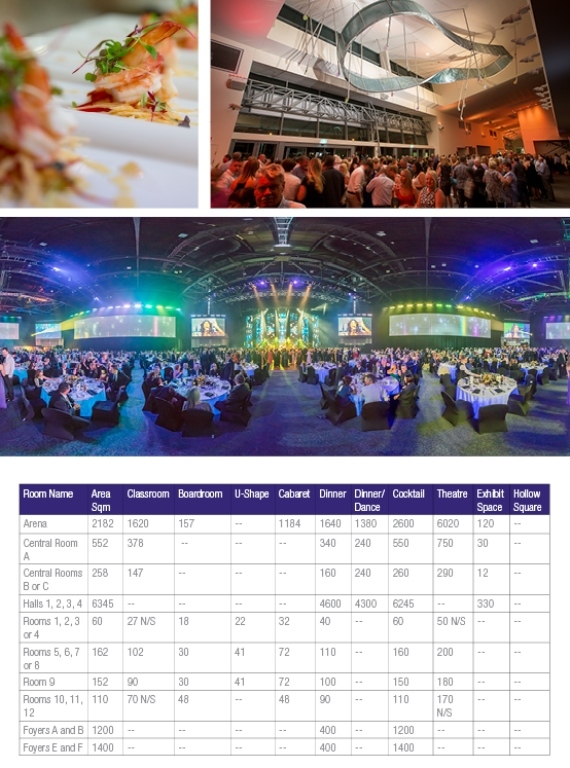 GCCEC's unique proximity to more than 3,000 accommodation options and 100 restaurants and cafes in the nearby Broadbeach entertainment precinct ensure delegates are spoilt for choice. Our multi-award winning team aspires to go above and beyond expectation, making the GCCEC an ideal place to host your next event.